نام مکان از بومیان Lenape آمریکا. فار راکاوِی (به انگلیسی: Far Rockaway) یک محله در ایالات متحده آمریکا است که در کویینز واقع شده‌است. در ۲۰۱۰ میلادی، فار راک‌وی ۶۰٬۰۳۵ نفر جمعیت داشته‌است. ↑ مشارکت کنندگان ویکی‌پدیای انگلیسی. «Far Rockaway, Queens». ↑ ۲٫۰ ۲٫۱ ۲٫۲ "The Best Queens Celebrities 2002", Queens Tribune. Accessed November 25, 2015. ↑ "Richard Phillips Feynman Facts, information, pictures". Encyclopedia.com. 2010-06-10. Retrieved 2015-11-26. ↑ Crowe, Portia (2015-05-04). "Carl Icahn told a story about his dad that always makes him tear up". Business Insider. Retrieved 2015-11-26. ↑ "Dr. Joyce Brothers: Television and Radio Writer, Producer, Host". The Paley Center For Media. Archived from the original on 2015-11-26. Retrieved 2015-11-25. The daughter of lawyers, Joyce Diane Bauer was born in Manhattan and raised in Far Rockaway, Queens. ↑ "Nancy Lieberman player profile". ODU Sports. Old Dominion University. Retrieved 2015-11-25. On May 6, 2000, the Far Rockaway, NY native earned her degree from Old Dominion University in interdisciplinary studies. ↑ "Lieberman, Nancy". Encyclopedia.com. 1996-05-06. Retrieved 2015-11-25. ↑ Carney, John (2008-12-22). "The Education of Bernie Madoff: The High School Years". Business Insider. Retrieved 2015-11-25. ↑ "IN SEARCH OF THE Z PARTICLE", The New York Times, October 26, 1986. Accessed October 2, 2007. "BURTON RICHTER was born in Brooklyn 55 years ago, but grew up in Far Rockaway, Queens." ↑ "Smullyan biography". University of St Andrews School of Mathematical and Computational Sciences. Retrieved 2015-11-25. 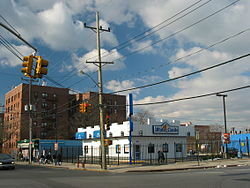 Raymond Smullyan, known as Ray, was brought up in Far Rockaway in New York City. در ویکی‌انبار پرونده‌هایی دربارهٔ فار راکاوی، کویینز موجود است. این صفحه آخرین‌بار در ‏۷ فوریهٔ ۲۰۱۹ ساعت ‏۰۹:۲۹ ویرایش شده‌است.